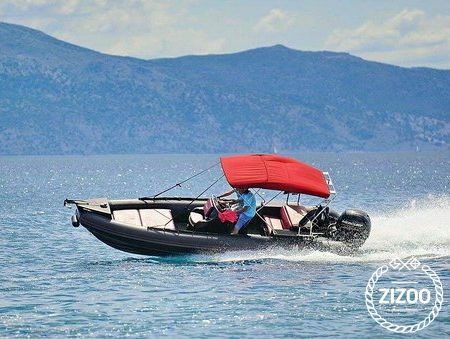 VIPER BULET is a 7m RIB, reliable and safe boat that can easily host 10 people. With its 4-stroke, 150hp Mercury, gives the pleasure of the speed of 25knots with a less of 1.2L per mile, and a max speed of 45knots. The boat can offer a comfortable shadowed ride around the amazing beaches of Lefkada. For you asking for some adventure you can visit Scorpios, the famous island of Onassis. Also you may sail to the magnificent island of Meganisi, where you can taste Greek Cuisine right next to the sea and dozens of other isolated beaches to enjoy privacy, crystal waters and plenty of sun. Last but not least you can visit Ithaca (the island of Odysseus), Kefalonia and the beautiful island of Paxos.